How is it already Wednesday? It's been a busy week around here and it seems to be flying by! Monday, I ran errands and hit the gym for a quick workout. My abs were still sore from the athletic interval class on Friday. (We did 'alligators' where we were in a push up-ish position with our knees on a mat and drug ourselves across the room - all I can say is they hurt and my abs told me about it all weekend!) That evening I was trying to get some spots off a couple plates that didn't come clean but Lexie wasn't having it so my sweet girl offered to help. What a sweet sweet girl! We've had gorgeous weather lately and it's been enjoyable to walk to school. Especially since Alexis isn't liking the car-seat anymore. I just said she was doing fine in the car and a week later she hates it. Hopefully the car-hating stage is very short lived! As well as this cat napping stage we are in this week as well - her longest nap in the past week has been 45 mins, maybe an hour max compared to 2 hour naps before. 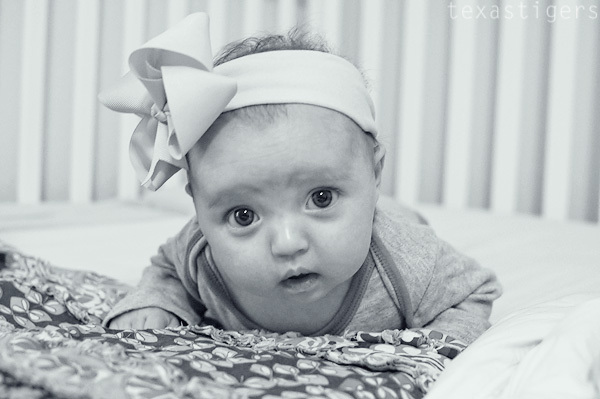 Alexis is starting to tolerate tummy time even more and lifting her head a little more. She still gets frustrated with it quickly most times and lets us know. During the day while Abby is at school Micah isn't often far away. Since I was taking pictures of Alexis, Micah was right there telling her "look at mommy!" HA! I'm trying not to go overboard and also to focus on the reason we celebrate Easter. That said one of my favorite things growing up was the stuffed animal in my basket. I loved stuffed animals as a little girl and I have to remember that when I look at Abby's toy box overflowing with stuffed toys. So instead of bunnies I'm going to have lambs in their baskets this year. Lambs for the Lamb of God. I love Amazon and found several cute options - I think I've settled on these 3. It's surprisingly hard because if Abby likes Micah's better or the reverse it could be bad news but I don't really want to get 2 of the same. I'm also planning on putting a cd in their baskets. After our spring break road trip I think we need more music the kids will enjoy. Abby loves the song Christ is Risen by Matt Maher but I can only listen to it so many time. I'm going to get some kids praise and worship music like they sing at Bible class during praise and worship time. I love that I could find all these on Amazon as it's Micah is aware of everything we buy - no more sneaking and hiding things for later if he's shopping with me - and I don't often go to the store without either Abby and/or Micah. Then to complete the baskets I'm going to try to find Chocolate crosses that I've heard Wal-mart carries and a tiny bit of other candy. What do you put in your kids baskets? I've blogged about it and now I'm finally posting the picture of the finished project. I needed a second set of hands to finish it so that someone could hold Alexis while I did her footprint. I came to this conclusion after I attempted a few times doing it by myself (then wiping it off and repainting the grey.) I think it turned out pretty cute. After Abby I came to the conclusion that for us a nursery wasn't really used much - other than a place for the clothes so with both Micah and Alexis they've started out in a crib turned co-sleeper. It gives me more sleep and they sleep better as well. 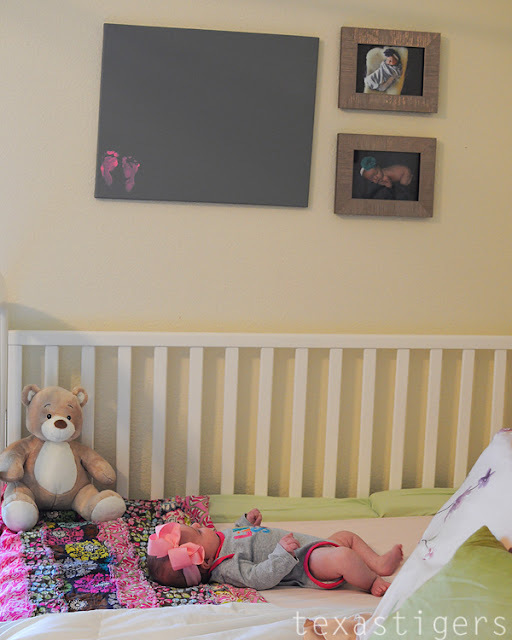 This however means no nursery to have fun decorating so in my mission to update all the walls around here I wanted to hang a few things in her little corner. As she gets bigger I'm going to add more sets of foot prints so there will be feet going along the bottom all the way across. Monday we had MOPS. I couldn't resist pulling out some of Micah's new spring/summer clothes. He picked his shoes. He loves his new Easter shoes and wants to wear almost all the time. Monday night, Beau wanted crawfish and for us to see where he works, so he took us out to eat. Abby remembered the crawfish he brought home and cooked 2 years ago and kept wanting a "real" crawfish. One of the waiters had actually brought a live one out to a table near us and so he then brought it over for Abby to see. After they took it away, she kept asking for it back and wanting one to bring home. Micah liked the live one but he also enjoyed eating a couple. That night while I rocked Alexis, Abby read her school reading books to Daddy. I love bedtime reading! Sweet little Lexie wasn't feeling well though and was very congested and coughing. She went to sleep easily but was very restless and she got upset soon after we had gotten the other two to sleep. So from 9 until 1 am I was rocking, swaying with, walking around with Alexis trying to get her comfy. Finally we crashed in the recliner downstairs where she slept comfortably on me. Unfortunately we were also having awful weather, including a tornado that touched down not that far from us. 1:30 am was when it got the worst over us with thunder practically shaking the windows. This of course woke Micah up and he joined us in the recliner because Daddy wasn't good enough for sleepy boys. Around 2 I manage to get him back in bed but it only lasted until 3 am. At that point Alexis was sleeping nicely so we could actually go to bed in the beds and not the recliner. So it ended up being a long night. We stayed home Tuesday and let Miss Alexis recover, thankfully she was already doing better by the morning and is now over it. I went out to Target today and got picture frames for pictures that I want to hang on the walls. When I came out and was buckling Micah in the car, a lady came up and gave me some pretty yellow tulips with this card for the Shine Project. Unexpected and nice. I happen to love tulips. Now I'm thinking of some way I can pass it on. I also got this cute little candy bowl from the dollar spot. Love that area of Target! I didn't make it to the gym this morning because I was still tired and recovering from our late night Monday so we switched up our routine and went this evening. I did a pinterest recipe of bbq chicken in the crockpot so dinner was ready when we got home which worked really nicely. I think I'm going to have to find more recipes that I'll eat out of the crockpot because I liked how simple that was! We left early for the class so that the kids could play at the park before since it was so nice out. I'm hoping to make it to the cycle class in the morning but pump was hard after a week and 1/2 break so I might be lucky to make it down the stairs in the morning. Ha! Q. What are your favorite spring cleaning tips? I was really feeling the spring cleaning bug a few weeks ago but spring break seems to have changed that. I really need to get back on the ball and get it done! To not make it seem like an overwhelming task I'm going to break it into small tasks I can complete easily (and quickly with little ones underfoot) and try to tackle one a day. I'm going to start by going through a de-cluttering because it will be easier to clean (and keep clean) if I can clean out some of the things we don't need. Especially if we can clean out a few of the toys to make clean up times easier after playing! I also plan on getting Abby and Micah involved. Abby can really be very helpful. It's hilarious though because one day she jumped at the chance to help me clean the bathroom but refused to clean up her toys within a 30 minute period. 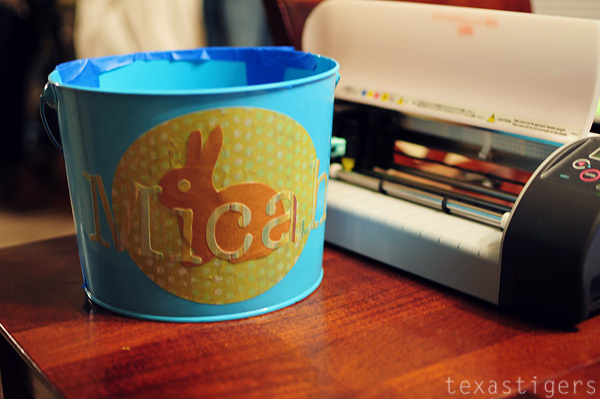 Be sure to check out other tips for spring cleaning on BlogHer and read Alicia's 10-minutes-or-less list. She's got a great list of cleaning you can do in just 10 minutes a night. She mentions taking one night to spend 10 minutes cleaning out your junk drawer. I think in our house I'd also add nights to do the nightstands in our bedroom and the bar between our kitchen and living room as they are also full of clutter. While you are over on BlogHer make sure you enter the sweepstakes as well! You could win a kindle fire and a $50 gc to go with it! 1. I'm excited that In Plain Sight is back on and sad it's the final season. I like that Mary's boss made her a pumping station at work before she even came back and was excited to show it to her - way to go.... however then they immediately disappointed me by the fact that she said she was already done breast-feeding. At least they tried showing a supportive work place. 2. I finally, after letting it go way too long, updated the header and sidebar to include Miss Lexie. I'll probably change it again in a few weeks with new updated pictures but this will do for now. 3. 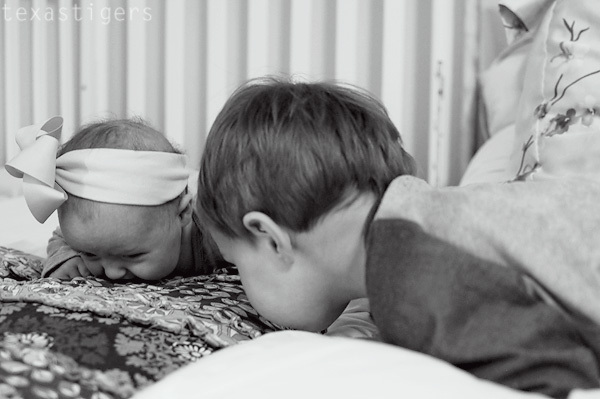 I'm so excited about the fact that I have a real family photo session scheduled. It's much needed as our last family photo that's hanging on our wall was when Micah was 6 weeks old. We did Christmas pictures a year ago and I have one of those framed on my dresser but not on our wall. We need to have a new one with Miss Lexie now and I'm super excited about it. I have the kids clothes picked out already, I need to get a shirt for Beau and figure out what I should wear. 4. I went to Hobby Lobby yesterday and got supplies for 3 projects. I'm almost done (for now) with one of them and hope to finish Lexie's Easter basket soon. Then the 3rd won't take long either. I just need to figure out where it will go. 5. Today was grocery shopping day since we were gone most of Spring Break we didn't get a chance to go during the week and ended up having to go this morning... the most crowded day of them all. Normally we would have gone to Church this morning but my little alarm clocks slept in and the last service was too late so Church was live streamed on the computer before we left. When he was little Micah had a year long streak of major dislike for HEB. I thought he had gotten over it... today not so much. We had battles to get clothes and out the door, he wanted to eat everything - berries, potatoes (raw), crackers, cheese stick, a donut - everything but the snack I packed for him. He wouldn't share the juice I got for them without a fit. The worst was trying to get him buckled in. I wonder what the nice guy who was loading up our groceries thought as I tried to buckle Micah in the car? 6. While I put away groceries, washed and got the fruits ready to eat for the week, got lunch together, unloaded the dishwasher and mopped the floor, Miss Lexie hung out in the bouncy seat. She's found her fingers a lot lately. 7. This afternoon we are going to finally use the Zoku and make some popsicles. That is if we can keep Micah from melting down as he's in a seriously grumpy mood today. 8. In fact while finishing up this post during a much needed 30 minutes of quiet time they were supposed to be having, Micah snuck downstairs while I fed Alexis. He busted into the cascarones and smashed them all. Abby and Micah had been at each other - mainly with him poking , jumping and trying to climb on her all afternoon since we got home from HEB so I was trying to have just 30 minutes of quiet since HEB wears us all out. Now the fun surprise I thought we'd play with later is all over the kitchen table and floor. Luckily I have some more I remembered that I had from last year so that Abby isn't upset about not getting any. I need a nap now though! 9. Okay my 30 minutes of quiet time is up.... and it seems Micah has fallen asleep. I hate to wake him because I know he's tired but I don't want him up fighting bedtime until 11 pm with a late nap like this. What to do? 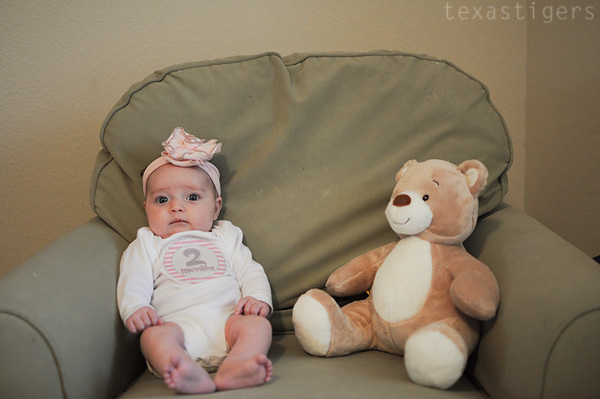 Alexis turned 2 months old last Saturday. 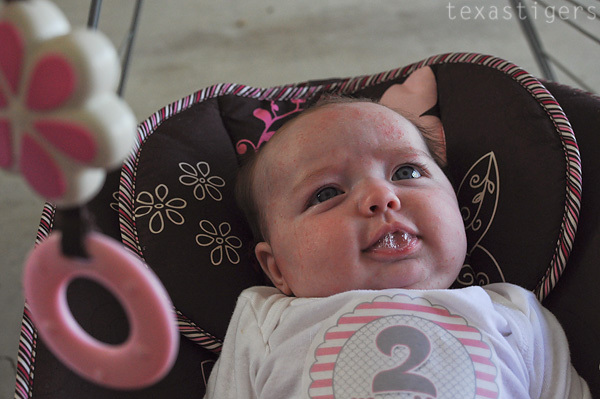 I can't believe she is already so big! (In a relative sense of course!) You are such a sweet, mostly easy going little girl. 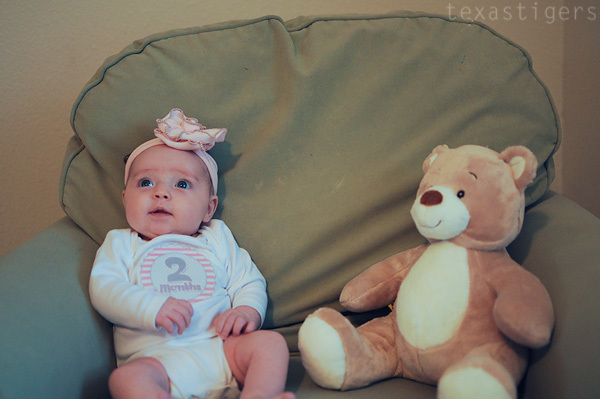 We went to your 2 month appointment this week and you are growing well! You smiled and 'talked' to the pediatrician showing off even though you were sleepy. You are okay with tummy time if we pick a good time but it doesn't usually last too long. You can lift your head pretty well but aren't doing baby push ups just yet. You are a big bubble blower lately. You also have a little bit of baby acne but a lot of it is heat rash and shows up when we are out and you are in the wrap. Yesterday we didn't leave the house and there is barely any hint of the acne/heat rash on your face. You love your evening bath time. 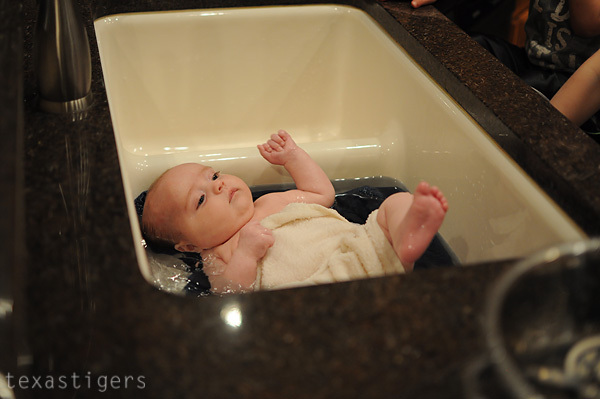 You get fussy during the evening when it nears bath time but calm down immediately when we get in the bathroom. While at Gigi's house you got sink baths because you fit so nicely in her big sink. At home you take a bath with Abby and Micah - yes all 3 at once. You like watching them play as long as they don't splash you! You are sleeping well (I'm hoping I'm not jinxing this by stating that fact!) with a 6 hour stretch before waking once during the night for the past week. Your older brother and sister didn't sleep this well this early. Lexie got a nice full bully while we waited for them. Doesn't she look sweet in her 'zoo' bubble? I couldn't resist putting it on her for her first trip the zoo, despite it still being a little big on her. Once the kids finished their train ride, Micah immediately started telling Daddy to "go see animals!" I think he was excited! The kids each got a map... I think they might have been more excited about the maps than the animals! They loved looking at them, especially Abby, to see where we were. Since Beau was with us, I was brave and let Micah walk for a lot of the zoo trip. I won't be so brave when I take him alone! Lexie snoozed away for most of the zoo trip in the stroller. She's been getting heat rash on her face really easily so I didn't wear her like I normally would have so that she wouldn't breakout as badly. Which she didn't until I carried her for about 10 minutes... then her poor face was covered. :( Hopefully she will grow out of it affecting her so much by this summer since it was only 82 yesterday which is not 'that' hot compared to the 100s in the summer. I didn't take a whole lot of pictures while we were there... I mostly just enjoyed being there and hanging out. Saturday - we headed to Target which ended up being an adventure since the power was out in the shopping center. Dark or not Target was still open with a few registers open using a generator. Abby was a super happy girl because she got a new hoodie. She takes after her mama with her love of jackets. (All 3 ended up getting pretty bright colored hoodies and Gigi and I think it will make an adorable picture to put all 3 of them in them on the beach later this summer for a picture.) In the afternoon it didn't take long before the kids were raiding the beanie baby box in Gigi's closet. Slowly but surely they are making sure none of them have their tags remaining on them. I had brought along a few toys for them to play with but other than in the car on the trip, those toys didn't get played with. Uncle Jeremy came over in the afternoon and the kids were super excited to see him as well. That night Pops cooked delicious steaks for dinner. A great day in my opinion! 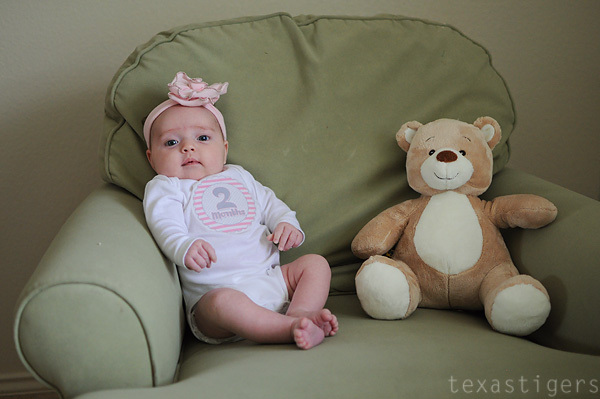 Sunday - Mimi and Pappy came over and got to meet Miss Alexis. We had another feast of ribs and bbq chicken for lunch (and leftovers for dinner.) Gigi, Abby and I also went out for pedicures that evening. My feet are very happy about that right now! Monday - Gigi had to go to class and it was rainy outside (as it had been the previous days as well) The library had story time so we headed over there. The kids enjoyed that then we met Gigi for lunch at Cane's. After lunch we were going to head to the park since the rain had let up but as we packed snacks it started raining again. So we played in the garage instead on the ride-on toys and some red light, green light. Tuesday - The rain had let up so we headed to the park in the morning. After an hour the kids were tired of playing so we walked by the fountains and the lake. They loved watching the fish jump in the lake. Can you spot Micah? 5 seconds after getting here he fell through and busted his lip climbing on this... it however took convincing for him to let me look/clean him up - he wanted to go back and play instead! It wasn't too bad thankfully! Afterwards we met Gigi for lunch then headed back to the house. I drew a "road" on the driveway for the kids to drive on. Abby was creative and added a lake, park and a man walking a dog. Soon though the kids were begging to go driving in the golf cart. Since there weren't any golfers out (that I could see) we headed towards the lake. It's one of their favorite places to go in the golf cart, so they can see the turtles and try and find the alligator who lives there. Most days it's hard to spot him as he's in the water and you can only see his nose. This day... not so much. He was out sunning himself on the edge of the water. Abby and Micah thought this was the coolest thing ever! You know you are in Louisiana when you don't have to go far to see a gator! Ha! Next time we go back to Gigi and Pop's house we'll have to take a side trip the alligator farm and see more as I think they'll love that. The only downside of being near the lake is we got attacked by giant killer mosquitos! I'm still itchy. I swear some of them followed us home because I keep finding new bites on me! While we were there Alexis got a couple sink baths because Gigi had the perfect sink for her to fit in. No worries about being splashed by her crazy siblings in her own personal tub! She seemed to really enjoy it! I'm jealous I don't have a big sink like that!